Snorkelling at the Great Barrier Reef in Queensland is undoubtably one of the most incredible, unique things I have ever experienced. There are so many amazing creatures, all going about their business and contributing to the ecosystem in their own ways. On a quest to witness this beautiful life-force before any more damage is done to it, I recently spent a week up in Port Douglas and Cairns (towns nearby the reef). This place has so many incredible sounding vegan options that we were overwhelmed for choice (and we took a somewhat ridiculous amount of time to decide upon them). Their salads are made fresh to order, so you can easily modify ingredients to your preference. We had the 'Bang Bang Bowl' - soba noodles, marinated tofu, mixed lettuce, wombok, carrot, cucumber, bean sprouts, coriander, spring onion, chilli, toasted peanuts w/ spicy szechuan dressing, and the 'Coconut Bowl' - rice noodles, marinated tofu, mixed lettuce, carrot, purple cabbage, red onion, bean sprouts, pickled green papaya, mint, coconut chips w/ coconut lime dressing. Both were fresh, flavoursome, filling and delicious. Betty's Bohemian Beach Cafe has vegan cacao buckwheat pancakes with chocolate coconut cream. Enough said. Although I guess I should add too that this cafe has a wonderfully charming atmosphere, and has several other vegan options such as a macro bowl, avocado toast, smoothies and various dairy-free milks. Mexican food with a twist - this Macrossan Street restaurant dishes up creative Mexican fare that celebrates local produce. Admittedly, a lot of that relates to seafood, but the vegan options here are still super tasty and interesting. We shared a bean and vegetable taco, grilled corn on the cob, and a hero fajitas dish which came with sizzling vegetables and lentils on a hot plate, fresh salsas, beans, rice, tacos and julienned vegetables. When in the tropics, one must have coconuts. It's obligatory, right? If you find yourself in town on a Sunday, make sure you head to the market by the harbour at the end of Macrossan Street. There are lots of interesting stalls to check out, but make sure you don't miss the coconut stall (it's run by a super lovely group of people who all happen to be vegan). Firstly you get to drink the freshly picked coconut (I should've brought my metal straw to save the plastic I know, whoops). Then once you're finished, you return the coconut to them to cut in half, whereby they fill each half with banana drizzled with coconut nectar and/or organic chickpea salad with tamari. Yum! On the note of markets, both the Mossman Market (Saturdays) and Port Douglas Market (Sundays) are worth checking out, and are a great place to stock up on locally grown fresh produce. (Think lots of exciting tropical fruits and beautiful organic vegetables). The Mossman Market is about 15 minutes drive from Port Douglas, and has more of a local feel than the larger Port Douglas Market. One of the stalls that was at both markets when I visited sold locally grown chocolate, which you could buy as raw cacao beans, vegan chocolate bars and even deliciously intense dairy-free ice-cream (made with their chocolate + organic coconut cream. In general, I found Port Douglas to be relatively vegan friendly, as most cafes/restaurants/bars had some form of vegan options. Lots offer a choice of several non-dairy milks (including soy, almond, macadamia and coconut), and there is plenty of vegan ice-cream/sorbet to be found. The local supermarket is packed with vego-friendly items too. A little further north of Port Douglas is the Daintree National Park, which is worth visiting if you have time and means of transport. It offers some beautiful sights and rainforest walks, and is quite different to elegant, almost metropolitan Port Douglas (it's much more rugged, and there's no mobile phone reception). Jackfruit burger salad plate and breadfruit chips (from produce grown on their farm). If you're looking for food to sustain you in between hikes (and dodging crocodiles ;) ), Mason's Cafe is an interesting spot to visit. Be warned that there is a lot of meat on the menu (including crocodile burgers), but it also has some cool vegetarian and vegan options with produce grown on the property, including pulled jackfruit burgers, taro & breadfruit chips and falafel. They make up sandwiches, wraps, burgers & salads, so vegan dishes are easily created. Beautifully refreshing fruit ice cream in a beautiful setting. The Daintree Ice Cream Co. is set on a 22 acre property and specialises in tropical flavours made from fruit grown in their orchard. They have several vegan and gluten free options, including sorbets, frozen fruit pops and fresh fruit cups (jackfruit segments were on offer on my visit). Their flavours change daily (according to what's in season), and we tried the mango and davidson plum flavours. The sorbet was nice and refreshing, and it was incredibly gorgeous to wander the native orchards afterwards. 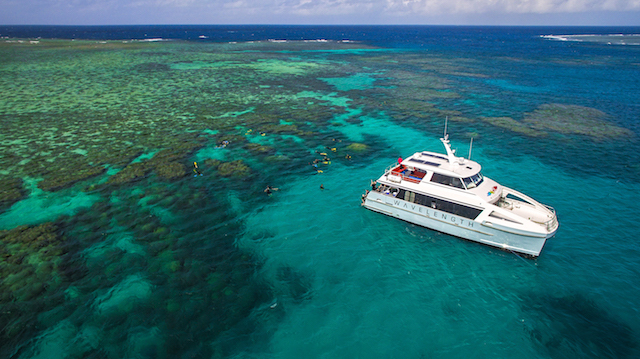 Wavelength is run by marine biologists who have a genuine passion for the reef, so it operates in an environmentally conscious way, it's educational and it allows you to travel to some of the best spots on the reef which the company has exclusive access to. It also has excellent vegan catering options (all that snorkelling will make you hungry) - just make sure you let them know dietary requirements beforehand. We got fresh fruit for morning and afternoon tea, and a lunch buffet of falafel, dolmades, wholemeal bread rolls and a selection of salads. Below is a little taste of life on the Great Barrier Reef. Isn't it incredible? *Great Barrier Reef photos credit of Wavelength. All other photos taken by me. (Yes, I'm one of those 'We have to take a photo before we eat it people'). Linen hankies versus disposable tissues? It's a simple step towards sustainable living.